Ever dream about staying right by the beach? 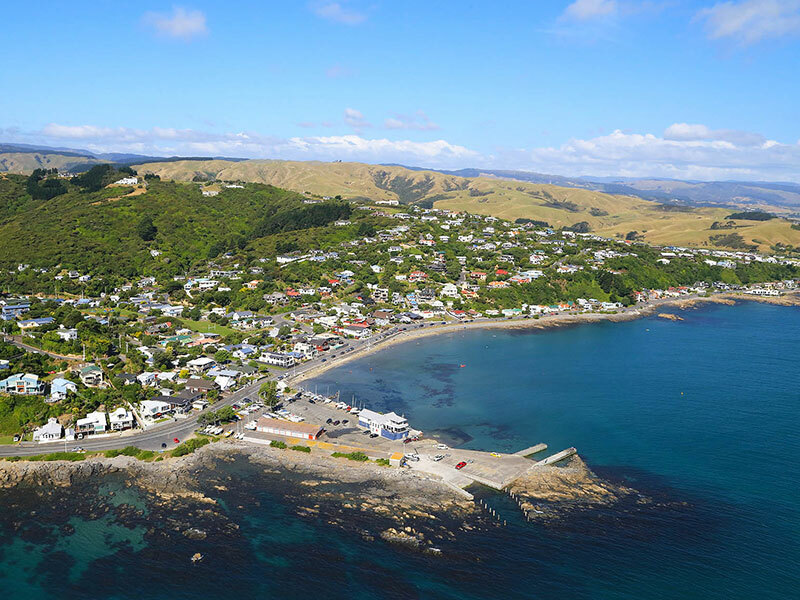 Plimmerton is just 20 mins north of Wellington city by car. Best of all, at our hostel the waves are virtually lapping on your doorstep. Moana Lodge is a gateway backpackers/hostel for catching the Interislander and Bluebridge ferries (just 20 minutes away). 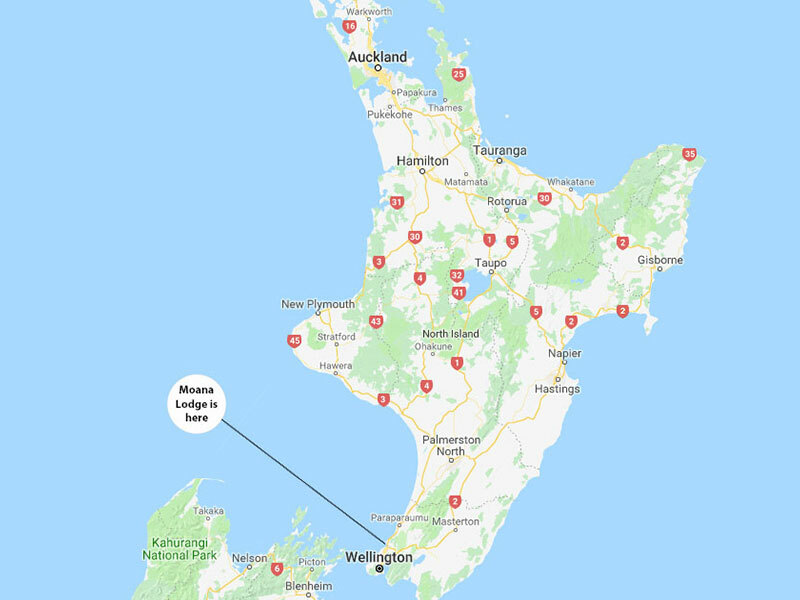 And its central location makes it an ideal location for trips to Wellington, Wairarapa, Kapiti Coast, Hutt Valley and Porirua. Drive North on SH1 out of Wellington. Keep on SH1, and drive through Mana. You will pass a Z Petrol Station on your left. Drive for a further 500 metres (approx). Then TURN LEFT WHEN YOU SEE THE PLIMMERTON SIGN (onto Steyne Avenue). You have now turned into PLIMMERTON. Go over the railway lines, drive through the village and follow the road around the beachfront. 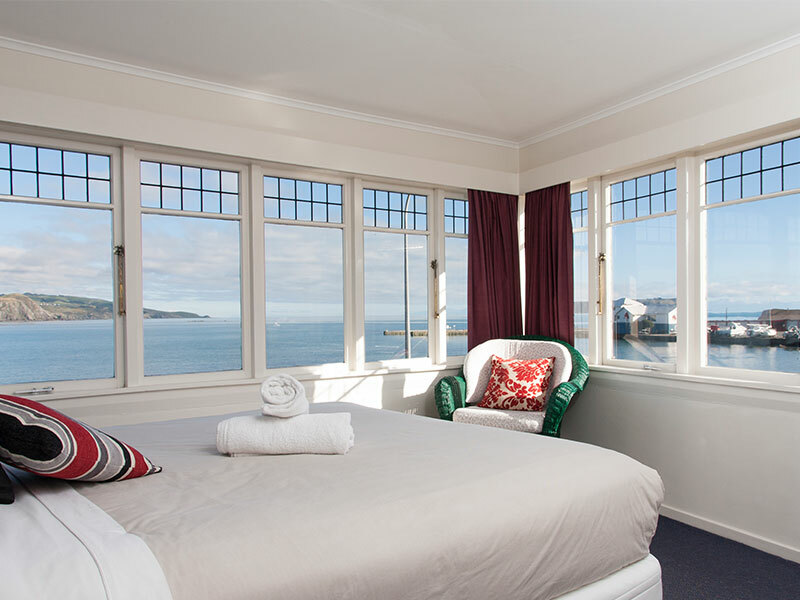 Moana Lodge is 1.2kms from SH1 opposite the beach on the corner of Moana and Cluny Roads. Note: We are 20 minutes north of Wellington by car if you are coming off the ferries. On SH1, you will drive past towns beginning with P – Paraparaumu, Paekakariki, Pukerua Bay then Plimmerton. DON’T TURN AT THE SIGN WHICH SAYS PLIMMERTON ESTATE. Drive around the roundabout and straight on. Go straight ahead through the traffic lights at the intersection with Grays Road. Pull into the middle lane on the road. Be prepared to turn right into Steyne Avenue at the next set of lights. You are turning into PLIMMERTON. Go over the railway lines, drive through the village and follow the road around the beachfront. Moana Lodge is 1.2kms from SH1 opposite the beach on the corner of Moana and Cluny Roads. The commuter train (catching the Kapiti Line) stops nearby at Plimmerton Station. The Overlander trains stop at Porirua or Paraparaumu. You are advised to GET OFF AT PARAPARAUMU and take the next commuter train to Plimmerton Station from the same platform. From Plimmerton Station; walk under the subway (turn left, then right once you get out of subway) walk along Steyne Ave through Plimmerton village, turn left at roundabout onto Beach Road and follow the road around the sea front and along Sunset Parade to Moana Road. We are on the corner of Moana Road and Cluny Road. Alternatively you can call a local taxi to take you. Phone 04 237 6099. The Intercity, Stray, and Naked Buses stop opposite the Z Petrol Station at MANA. This is a REQUEST Stop. And, put your luggage on LAST, that way the driver can get it off easily. From the bus stop; walk northwards away from Wellington past the Z Petrol Station on your left. Go for a further 500 metres (approx.). Then TURN LEFT WHEN YOU SEE THE PLIMMERTON SIGN (onto Steyne Avenue) go over the railway lines, through the village past Plimmerton Railway Station. From Plimmerton Station walk along Steyne Ave through Plimmerton village, turn left at roundabout onto Beach Road and follow the road around the sea front and along Sunset Parade to Moana Road. We are on the corner of Moana Road and Cluny Road. FREE pick up and drop off for our guests from Plimmerton Train Station or Mana Bus stop. 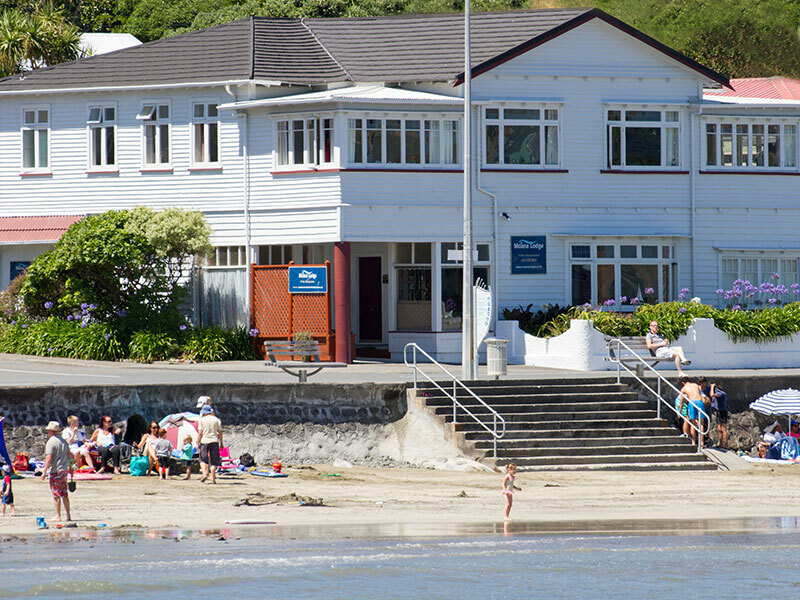 Whenever humanly possible, we are happy to pick up and drop off our guests from Plimmerton Station or Mana Bus stop. Just ask. Otherwise, enjoy the flat 1.2km walk along the beachfront to the hostel. By Car: We are 35 minutes by car from the airport. Local Transport: If you are coming from the airport, catch the airport shuttle to Wellington Railway station then take the commuter train to Plimmerton Station (catch the Kapiti Line). By Taxi: If you were to take a taxi it may be quite expensive, e.g. $100 approx, so it’s much cheaper to use our local public transport as explained in the point above. By Car: We are 20 minutes to/from Wellington, to the Kapiti Coast and to the Hutt Valley. By Train: We are 25 minutes from the City. The ‘Kapiti Line’ is the line to catch, and simply get on and off at the Plimmerton Station. From Plimmerton, the train goes right into the Westpac Stadium.